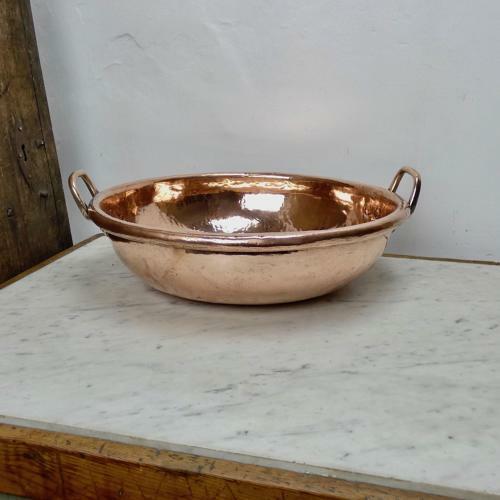 A large, but shallow, French copper sugar pan. This would have been used for caramelising sugar in the sweet making process. It is made from a very heavy gauge of copper and it dates from c.1840. It has a wide, castellated seam part way down the side, as it has been made from two separate pieces of copper, and the copper has a planished finish to the interior. It has brass handles which are very primitive is style and the bowl was probably country made. There is pitting to the copper on both the interior and the exterior, as the piece has seen a lot of use. Price includes postage within the U.K. Shipping to the U.S.A. add £60. Western Europe add £20.